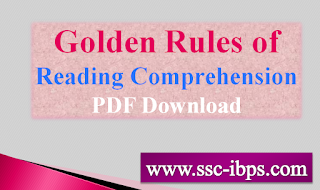 Golden Rules of Reading Comprehension PDF Download: Reading comprehension rules are used to how to follow and attempt the given passages in competitive exams. These rules help us in various exams, especially in IBPS exams most of the peoples doesn’t follow the rules and they made a mistakes and they lost their big opportunities. But brilliant students follow these rules and reach their goals. most of us do not follow the rules and some of us don’t know about common rules. so keep learn these golden rules and get your Chances. We hope all of you learn these golden rules and will get success. Below this post we are enclose the Golden Rules PDF Files Free Download here. 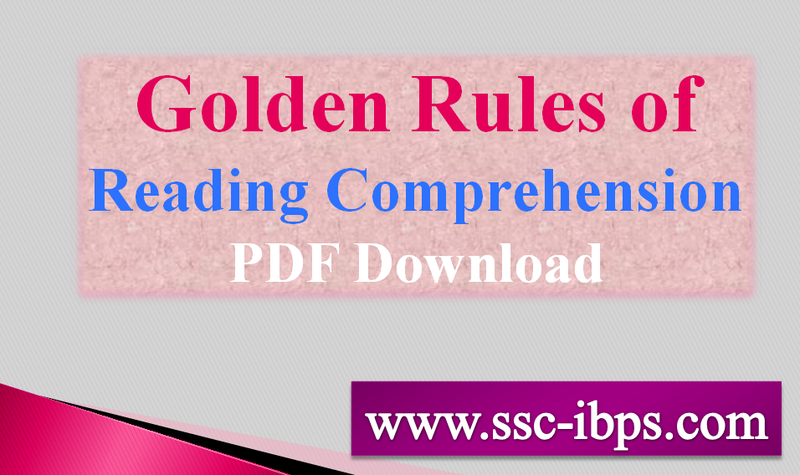 Below this article we are providing the best golden rules of reading comprehension tips for banking Clerk, PO, LIC and All Complete Competitive Exams. In Reading Comprehension Mainly Six Rules are follow every one can must pass the written test and get the high score. Do not go blindly your opinion add to what the author‘s given passage. It means while you are attempting Reading Comprehension questions don’t apply your general knowledge. Strictly follow domain of the passage. Give first preference to which one is familiar to you. After that select another subject which one is unfamiliar to you. For example if you are science student ,you will choose physics or chemistry, like wise a arts student may choose either Economics or Commerce. Our elders tell us “ first impression is best impression”. So, ”If your first step is good, your remaining steps also will good” first attempt the passages well known to you, thereafter choose passages are not known to you. When you are reading the passages, underline the keywords like “if, hence, but, thus, in spite of,yet although”. These keywords are turning point of the passage according to cinema knowledge they call as twists. most of us well known that word. So, we have to observe these words and underline while we are reading the passage. If any question asks about particularly about something, find out where the key words given in the question in the passage. First read carefully and after that answer the question. Many times a single sentence from the passage may lead to wrong answer. So, be careful while you are answering question from the given passage. If the question asks about Synonyms or Antonyms read 1 to 2 lines before the sentence and after the sentence where the word occurs. 1) If the question asks about ‘Main Idea’ or ‘Central Theme’ of the passage, then keep read the beginning and ending lines of the passages. 2) If the question given about ‘Title’ you better go middle of the passage. the title neither special nor general. The title should be the central theme of the given passage and also it should be describes ideas of all paragraphs in the given passage. 3) If the question asks about ‘Tone or Mood’ then find out the emotion in the passage. The words like ‘smooth, probable, surely, magnanimous’ conveys positive emotion and ‘the words like ‘grumbling, roughly, miserly, improbable, etc. conveys Negative emotion.